Welcome to the second day of testing at the Circuit de Catalunya outside Barcelona. It's a little bit overcast here this morning, but we're hoping the sun will burn through the cloud as the morning progresses. Lots of young drivers out today, with Verstappen, Ocon, Stroll, Vandoorne, Kvyat, Magnussen, Palmer and Giovanazzi all driving today. They will be joined by the oldest man in the field, Kimi Raikkonen, as well as both Mercedes drivers. A new approach to social media from F1's bosses means you will be seeing more videos like this over the next couple of weeks. Teams are now allowed to film small clips from within the paddock and all of them have jumped at the opportunity. Raikkonen is the first out the pits, followed by Stroll, Giovinazzi and Magnussen. Great to see F1 back! A bad start to the day for McLaren as Vandoorne's car returns to the pit without power. The marshals come out to give it a push and it is soon greeted by McLaren mechanics. All looks very similar to yesterday. @Laurence: Good morning Laurence. Yesterday, Lewis mentioned about wider tyres and the grip they offer. Now if that is true, then will the degradation will be lower ? which will in turn lead to lower number of pit-stops and thus we may end up seeing numerous one stop races ? @Nitish Yep, that seems to be the case. It all depends on the compounds Pirelli brings to each race. So far most of the running has been on softs and degradation has been low. Pirelli were asked to deliver tyres that had low degradation so that drivers can push harder for longer and don't need to save tyres. The downside to that is that there is a chance a lot more races will be one-stoppers. It seems you can't have the best of both worlds. I should add that Pirelli were between a rock and hard place over the winter. They tested with mule cars last year but only had simulations from the teams to guide their development ahead of yesterday's opening test. In order to make sure we have tyres that can race, it's understandable if they went a bit conservative with the compounds. "Based on initial investigations, we think the issue is related to the shape of the 2017 oil tank" - Is it just me or does this actually sound worrying? Seems like a design issue and surely those can't be easy to fix? @Siddhesh, yep, that's pretty worrying but it's also quite vague. I couldn't say with confidence how difficult that will make it to fix, but the oil tanks and their positioning tend to be a key part of the architecture of these power units. @Charbel, lower from what most people were saying. Hamilton sets a 1:26:834 on his first flying lap. Only installation laps so far, so nothing to get excited about. @Krishna, Possibly later in the season Pirelli will be more aggressive with compound choices, but because they only have the relatively cold weather testing here then they are planning to go conservative for the opening races (again, to make sure we have tyres capable of racing). Barcelona is a pretty intense track for tyres, so if the soft is not degrading that much then the chances are the tyres are much more stable. The big question is whether Pirelli has successfully built a "cliff" into the performance of the tyres, so that performance will fall dramatically once they are taken to a certain amount of laps. If they can do that -- essentially by layering compounds -- then maybe they can put a limit on how far the drivers can go and induce more pitstops without drivers needing to nurse their tyres. But it's still early days, so we will have to wait and see what the drivers, teams and Pirelli feed back to us over the course of testing. Looking at the zero size cars like Red Bull and Ferrari, I almost worry about the driving in close quarters. The floor is so big and so low, that it could be deceptive when going wheel to weel, and the drivers hit each other's floors. Thoughts? The problem with F1 is that it is perennially in a confused state over what it wants, and keeps tilting from one extreme to another. Those in power wanted a rapidly degrading tyre at first that would lead to more pit-stops, and thus create greater excitement through strategy. This of course lead to drivers who had to drive within themselves to conserve the tyre better. After complaints, they have now gone back to tyres with lower degradation. Additionally, they also wanted faster cars so that meant greater downforce and this means the cars are now that much harder to overtake too. The result? Processional 1 stop races. I very much hope I am wrong, but this does appear to be where we are heading towards. 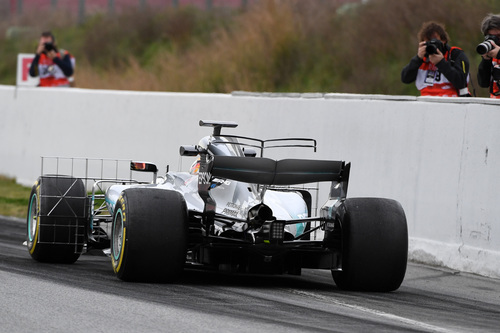 No sharkfin on the Mercedes this morning, but it shows how quickly that car is developing that they completed 152 laps on the first day and are already bringing new parts at a quick rate to the car. "Here's what the McLaren Honda looked like while it was still running on Honda power (as opposed to being pushed by people power)" - Make sure you pass on the burn salve to the Mclaren team Laurence! Easy two compulsory pit stops. Minimum of 4 tyres to be changed. Make them stop and push the tyres. @browgreg75 A possible option. Seems a bit artificial to me, but then I suppose so is the mandatory pit stop and quick degrading tyres. HI Laurence, I will visit the training next week, should I bring ear plugs or are the sound of the cars the same as last year ? @Martijn The cars are only slightly louder than last year. I happily walked around the inside of the circuit yesterday without earplugs, but it's probably a good idea to pack some in case your ears a more sensitive than mine! I thought the early 2013 tyres were pretty good and made for good racing until pirelli made some change to it because it kept exploding. If they could have kept the characteristics but made it not explode, i think they had a winner there. @browgreg75 good idea! I love the technology of the engine but I am a fan of the old screamers. The problem for me is Honda with their 2 years of expert changing of blown up engines should be able to change an engine quicker than anyone else!!! Compare to the old engines with were pretty well plug and play. @browgreg75 The installation of new engines is always tricky - remember this new Honda is pretty much all new. They also don't want to put another one in only to have the same problem again, so they are also looking for any hints as to how to solve the issue. When it became clear that it would need greater analysis they changed the whole thing, but it's not the work of a moment with these cars and all the power unit components. this is one of the downsides of not allowing a spare car. they should at least allow it for testing or let both cars run since they only have 4 day per driver allocated. @MB99999 guaranteed Perez could. He is magical with preserving tyres. @MB99999 It all depends on the compound being used. But the first year in Russia the teams said it would be very possible - they were actually experiencing negative degradation when the car gets quicker as the fuel load goes down and the tyres hold on. With this year's tyres it might be possible, but we are only on the first day of testing and perceptions about these things do tend to change. Remember in 2005 the tyres had to last a whole race by regulation. Good news McLaren and Honda fans! 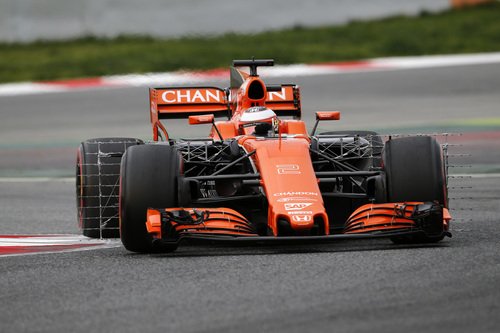 Vandoorne is back on track, so hopefully that was a minor glitch this morning. @Keith, If Honda are struggling with all their technical know-how and resources, I imagine McLaren would struggle even more. McLaren don't make their own engines for their road cars, they outsource to Ricardo (and soon BMW).